The full prescribing information for Soolantra has just been released. This document forms the official information made available to doctors when contemplating prescribing Soolantra to their patients. Read the full Soolantra Prescribing Information [PDF Link]. The prescribing information for a prescription product normally contains more detailed and specific information than you find in the an advertising campaign or flyer. Soolantra is indicated for the treatment of inflammatory lesions of rosacea. Soolantra is to be applied to affected areas of the face once a day. Soolantra Cream comes in 30 gram, 45 gram and 60 gram tubes. How likely is it that you will have a bad reaction to Soolantra? The occurence of adverse reaction during the clinical trials was low. This is good news as it may indicate that Soolantra will be generally well tolerated by rosacea sufferers. During clinical trials, 2047 subjects with inflammatory lesions of rosacea received SOOLANTRA cream once daily. A total of 1555 subjects were treated once daily for more than 12 weeks, and 519 for approximately one year. Adverse reactions, reported in ≤ 1% of subjects treated with SOOLANTRA cream for at least 3 months in vehicle-controlled clinical trials, included skin burning sensation and skin irritation. For the list of ingredients see Soolantra Ingredients. Forgive my ignorance, but does this mean it is now available? Just got off the phone with Walgreens in CT. Their rep does carry Soolantra but I received a cash only price of $330.00ish with a script. I have a call into my dermatologist to get a script over to Walgreens so I am hoping there will be no roadblocks and I’ll have this in hand asap. Just had some vbeam on Friday and I am bruised up so I have to wait till that clears anyway. I will post more if and when I get this stuff. I posted this on another page so I’ll post again here, my script went through but my insurance does not cover and I anticipated having to pay full price just to see if this stuff worked for me. Boy was I surprised when I downloaded the discount card from Galderma and showed the pharmacist at Walgreens, the cash price was $330.00 and I walked out the door paying $25.00, that’s it $25.00.., could not believe it. I started using it last night with no ill effects so we’ll see. My fingers are crossed and I’ll keep posting. Do yourself a favor and print out the coupon it does really work, at least for me it did. Going on day 6. Seems to be doing something positive, no ill effects but still too early. I have one area that always gets a huge legion and it is still there and it actually has gotten redder and more intense but I am hoping that is my skin purging out bad stuff, in another area that was a problem it seems to have calmed quite a bit so I am hoping all will keep improving, time will tell. I will post again in a week or so. I would like to know this also, do doctors have permission now to prescribe? I asked my dermatologist last week and they indicated it was not on the market yet. As Soolantra has only *just* been approved by the FDA it will be several weeks if not a couple of months before it appears on doctor’s availability. That is very good to know. I am really excited to try it. Thanks – as always David! I for one am eager to give this a go. Not sure how to interpret this – if the 519 subjects who used it for one year are part of the 1555 who used it for more than 12 weeks, then almost 500 subjects dropped out of the study before the 12 week mark. If that is correct, then I wonder why they dropped out – it could indicate a much higher rate of adverse events, as adverse events are reported only for users who hit that mark. 1555 subjects received it for a minimum of 12 weeks whereafter they either stopped by protocol or other reason. The protocol may have asked for a minimum of 12 weeks. The 519 carried on for a whole year. Exactly, Frank! That is what I couldn’t determine – if the total set of subjects was the 1555 (12-weekers) PLUS 519 (one-year folks) and there was a typo, or if the total pool of subjects who used it from 12 weeks to one year was just the 1555, leaving 492 who dropped out before 12 weeks. This would be a very high drop-out rate. That high a drop out rate would warrant explanation. But the typo explanation is more likely, especially given the transposition of numbers, which is a good catch that I missed. The PI definitely says 2047 which may indeed indicate a typo. Will this be available online? I live in Asia. do we know how much–another $300 that may not work. 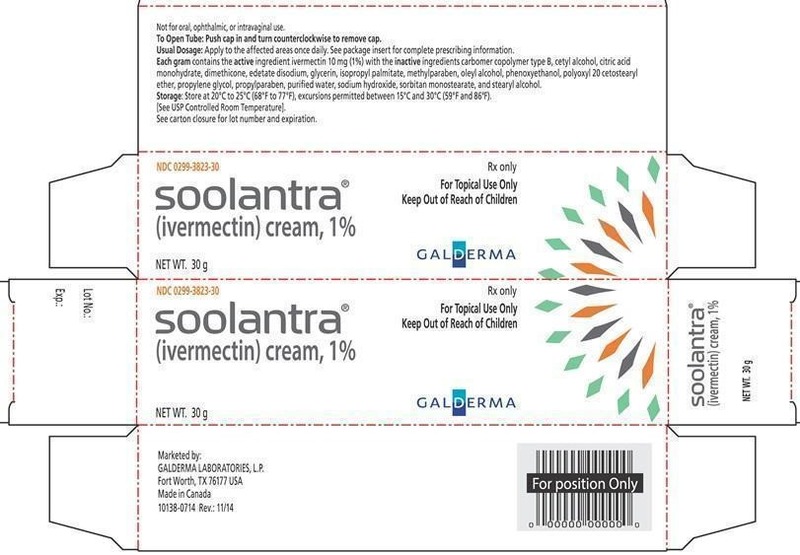 Soolantra is Ivermectin which has been used topically and orally for scabies, but in this formulation and prescription is for the topical treatment of the papules and pustules of rosacea. Clinical trials have shown that it does work for rosacea lesions. Ivermectin will kill demodex mites and may show some other benefits that help reduce the lumps and bumps of rosacea. Just how well it is liked compared to Metrogel 1% and how easily it can be obtained is to be determined. I thought when the demodex theory of rosacea was first being discussed, it was said that the mites exploded when they died and the bacteria released lead to the inflammation and p&p’s. If you use this cream, do you have massive inflammation due to the die off? Also, isn’t ivermectin quite toxic? I’m wondering about the long term safety of something like this. Can anyone clarify? Has anyone tried Soolantra yet? Anyone got any news on an Australasian release? and also you think your be able to stop using the cream once the mites are dead? Type 2 Rosacea, Ocular Rosacea and Phymatous Rosacea is caused by lack of stomach acid and pancreatic digestive enzymes. You probably need proper absorption of food to make your immune system function correctly in Rosaceans. I also have a strong suspicion those pancreatic digestive enzymes are quite important in tackling the demodex. How this causes the demodex population to become irritants is anybody’s guess but it does ? The bacteria is in the demodex’s stomach that causes the spots. I was on antibiotics and it knocked out the spots but the demodex soon returned if you are lacking stomach acid and pancreatic digestive enzymes. Spots take longer to return because of the antibiotic course than the actual demodex irritants. If you got reflux and gastritis like me you in a catch 22 situation because I cant supplement those things at the moment. Type 2 Rosacea, Ocular Rosacea and Phymatous Rosacea is caused by lack of stomach acid and pancreatic digestive enzymes. You probably need proper absorption of food to make your immune system function correctly in Rosaceans. I also have a strong suspicion those pancreatic digestive enzymes are quite important in tackling the demodex. How this causes the demodex population to become irritants is anybody's guess but it does ? The bacteria is in the demodex's stomach that causes the spots. I was on antibiotics and it knocked out the spots but the demodex soon returned if you are lacking stomach acid and pancreatic digestive enzymes. Spots take longer to return because of the antibiotic course than the actual demodex irritants. If you got reflux and gastritis like me you in a catch 22 situation because I cant supplement those things at the moment.. I have awful inflammatory rosasea that would flare up and feel like bug bites on my jawline and upper neck. On top of how unsightly the bumps were. I tried an 8 week regimen of MetroGel and I saw absolutely no difference. At my follow up my doc suggested Soolantra. I have been using it for 4 weeks now and I can say I am finally noticing the bumps decreasing. Another good part is that I no longer get the feeling that I’m being bitten with itchy burning sensations. That’s completely gone now. I’m going to continue using it and hope it continues to get rid of all the bumps. At this point that’s all a girl can ask for since the redness looks like it’s here to stay. Hope this helps you guys.